I’ve been wanting to write a blog post about the Wild Drinks Workshop last month with Sunny Savage of Wild Food Plants of Hawaii and Emily Han of Wild Drinks and Cocktails, but often I prefer to take my time to develop the post and edit and reedit. So here is a Stream of Consciousness Saturday post, part of a blog hop hosted by Linda G. Hill, in which the theme is drink. I’m not allowed to edit, other than correct typos! Sunny Savage is a noted wild food expert who recently wrote a book called Wild Food Plants of Hawaii. Emily Han is another foraging practitioner who authored a book called Wild Drinks and Cocktails. They “met” or knew of each other through their books and reputations and exchanged books, which were published by the same company. Sunny who lives on Maui, recently asked Emily to do a drinks workshop with her. I debated taking the workshop because it was on the same day as another big event for me, the Maui Charity Walk, and I knew I’d be wiped out. This is one of the few pictures where Emily and Sunny are together. I intended to take a better photo of them together after the workshop but everyone was a moving target afterwards - probably from all the herbal tonics and infusions and the "buzz" of mixing drinks. In a word, the workshop was marvelous. Yes, I took copious notes and photos, but the main thing I remember, without looking at my notes, is that Emily talked about a magic ratio used in making a drink. I’ve never given a hoot about making drinks special. I’m not interested in bartending or mixology. I hardly drink any alcohol. But, this workshop was an opportunity to create potentially healthy drinks and a way to sneak health food into my husband. 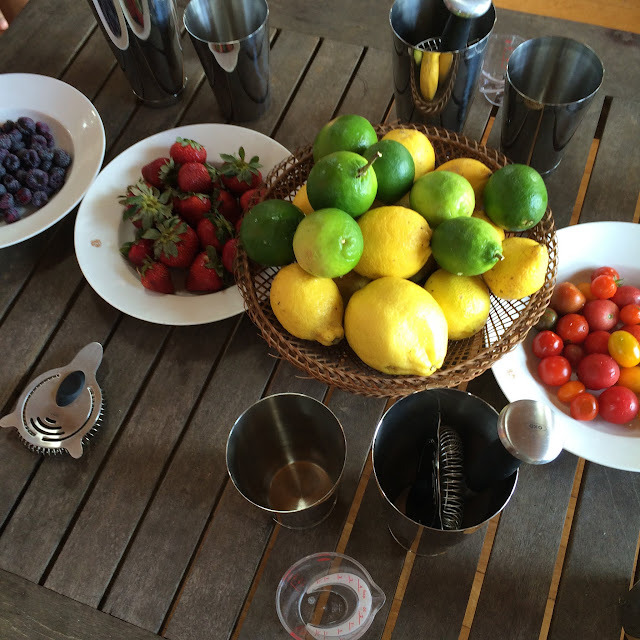 Fruit mixing table with bartender mixing cups and sieves. Uh oh. I may have to look at my notes. It’s 1.5 oz, no, it’s ¾ of an oz, ¾ of an oz, and 2 oz of sparkling water. Let’s see, did I get that right? Oh I did, I just looked at my notes. 2 oz of sparkling water or mineral water. Emily is demonstrating smashing fruit, or maybe she called it "muddling" fruit, to add to a mix. This creates a magical fusion that is far more than the ingredients by themselves. The sour aspect adds a zing to the sweetness, that dances on the tongue. Sunny talked about the kinds of wild foods in Hawaii one can use for the sour and for the sweet tones. In Hawaii, we have an abundance of passionfruit, which we call lilikoi – sounds like "lily koi" (like a waterlily and a koi fish – the Japanese carp that are beautiful in fish ponds). Lilikoi is sour with sweet undertones. Popolo berries, which are tiny and grow wild in Hawaii. Popolo means black. It's also a term in Hawaiian to refer to black people or people of African descent. Since this is a blog hop for Saturday Stream of Consciousness, I don’t want to write a long post. Both Emily and Sunny talked about combinations of sweet and sour, gave examples of herbal infusions and decoctions, and probably many other things I forgot about. The setting was gorgeous – a Balinese style home with a high ceiling, filled with flowers and herbs and ripe, succulent fruits. Sunny lives in Haiku, lucky for me. The outdoor deck outside the kitchen and living room. We had the opportunity to make several of our own drink combinations, use salt to make margarita-style drinks, and create herbal concoctions. Our drinks were non-alcoholic, but one would easily turn our mocktails into cocktails by replacing the sparkling water with vodka or another alcohol. The flower on the left I think is Turkish caps - like hibiscus, but always closed. 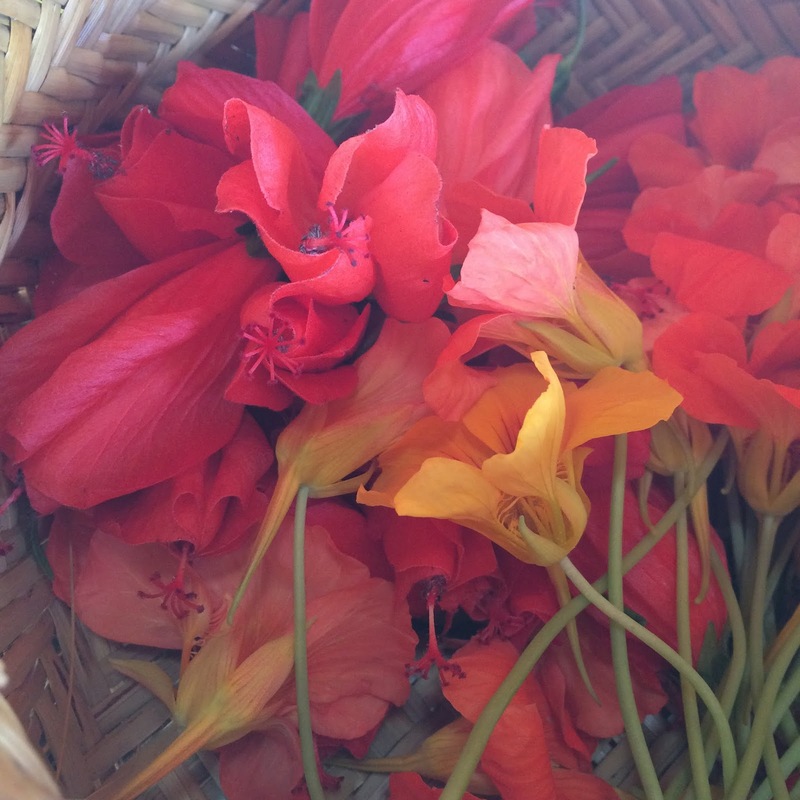 The other flower is nasturtium. I went home feeling like I had learned one of the secrets of the universe. Even with cooking food, I became aware of how some dishes have that extra zing or secret ingredient that makes the flavors stand out. Sometimes adding a little bit of sour to a dish can improve the flavors, like adding lime juice or vinegar to soup. Another area with herbal tinctures, herbs, salts, essences, hydrosols. Even if I don’t remember the ratio, or have to guesstimate, the main thing is - a little sour, the same amount of sweet as sour, and a larger proportion of sparkling water (or alcohol) - is fantastic for flavor. And it’s not set in stone - one can make it sweeter, or more tangy. If you read this, maybe you’ll be inspired to experiment with items in your kitchen, or look at Emily or Sunny’s books for inspiration. Note: I paid full price for this workshop, so my "review" or experience is not affected by receiving something for free. I don't own either book because the space on my bookshelves is limited and I have to release a few books before I buy any new ones! I have included Amazon links for both of the books above. One can also purchase Sunny's book as an ebook for the ipad - I think the link is on her website.